Here’s the deal: According to the reviews on Goodreads, you either love or hate Great-Aunt Sophia's Lessons for Bombshells. And, as I'm sure you've already guessed (because I'm reviewing it) I'm firmly in the LOVE category and can't wait to tell you all about it! So let's get started! Yay! Grace Cavanaugh is the kind of woman I thought I wanted to be when I was a teen. Namely, a woman pursing a doctorate in Women’s Studies who firmly believes that physical beauty only leads to misery. Now, I’m actually not sure we’re on the same page there, but the doctorate in Women’s Studies is certainly similar to me. Grace is gritty, hard to like (at first), but she genuinely believes in her studies and firmly stands by the lens through which she views the world. She spends WAY too much time overanalyzing EVERYTHING and, at best, I’d say that she’s oversensitive. Now, that’s not to say that a little sensitivity to patriarchy is a bad thing, but when it CONSUMES you and you see it EVERYWHERE, then you’re never going to be able to enjoy anything. Again, this is something I can sympathize with, even though I was never quite as intense as Grace. Anyway, Grace decides that she’ll research her Great-Aunt Sophia, a former B-movie star/bombshell because she is now eighty-five and in need of help after a major surgery. And, because this is fiction, firecracker Great-Aunt Sophia convinces Grace to let her transform her from “frumpy feminist into a femme fatale.” Add a super hot and kind of douchy man named Declan and a slightly strange but still attractive doctor named Andrew, and you’ve got one heck of a great read. 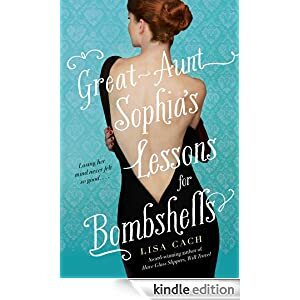 So is Great-Aunt Sophia’s Lessons for Bombshells a predictable romance? Yes and no, but that’s besides the point because the journey to the end was incredibly entertaining. Many of the reviewers had issues with the plot being “ugly girl suddenly gets pretty and men fall at her feet” but I think that they may have overlooked the genuineness in Grace’s character. I truly felt that she believed in her position that beauty only leads to misery and I really enjoyed watching her grow and accept that she may have misjudged a few things. Also, she's the kind of gal that supremely awkwardly-embarassing things happen to, which were some of the novel's more hilarious highlights. This is a heartwarming, funny, and fairly deep romance that I’m very happy I read, which is why I’m giving it my MUST READ recommendation! Happy Friday, everyone! And thanks to Heather and Katie for hosting!